I share a web tip on my podcast every week. For #LOLshow Episode 22, the featured tip is Know Your Meme, the Internet Meme Database. A funny thing happened while we were recording Episode 20. After we had recorded the show, we noticed that the term ‘Zangief’ was trending on Twitter. We went, huh?, not knowing why the term was trending. I wasn’t really into technology growing up. I think I only started to get into it after discovering computer games. The first PC game I remember playing was Digger. I don’t play games anymore. My first ever gadget was a lousy Phillips Walkman. I hated everything about it. Lousy battery, lousy headphones. In high school, all I wanted to do was to chat with my friends on IRC. But Dad wouldn’t let me. In hindsight, I’m glad I didn’t. I first started blogging in October 2003 (!) on Blogger. That first blog is too embarassing to link to, but if I had continued blogging there I think I would have been 1 of the earliest blogs in Malaysia. Since then I started almost a dozen more blogs. I graduated from Blogger and was a Movable Type buff for a long time and finally switched to WordPress which remains my blogging platform of choice. I’ve been using the blogjunkie handle since 2005. I think it suits me because of the number of blogs I have. Because of blogging, I’ve also learnt standards-based web design, some programming and Unix, social media, web analytics and optimisation, and even web server performance tuning. I switched to a Mac in February 2006 and I’ve never looked back! Call it seeing the light or whatever, I’m now an evangelist for life. I’m the editor of myMacBUZZ, Malaysia’s #1 Apple weblog. Told you I’m an evangelist. Unfortunately at work, I have to use a Windows Vista laptop. Ugh, what a disaster. I’m actually looking forward to upgrade to Windows 7. My first ever iPod (a 1st generation shuffle) introduced me to Apple. Since then I’ve had a 5th gen iPod and an iPod touch. I purchased my first domain name February 2004. At last count I have 14 domains. The people I admire most in technology are Leo Laporte, Scott Sigler and Steve Jobs. My favourite blogs are TUAW, Lifehacker, Daring Fireball, and Occam’s Razor. I also really enjoy listening to podcasts. My favourites are Buzz Out Loud, TWIT, MacBreak Weekly, and Scott Sigler’s Bloodcast. I’m a really big fan of sci-fi too, especially space dramas. I love Star Wars, Star Trek and Battlestar Galactica. I really wish that I had studied computer science. If I had, I would have built the Next Big Thing. Who knows, I could be in Larry or Sergei’s shoes. ..but not more than the internet. If I had to choose between the 2, I would ditch my iPhone for the internet in a heartbeat. I’ve never had a formal diagnosis for internet addiction, but I’d bet you I’d be a textbook patient. My current dig is web analytics. It’s my day job but it turns out to be something I actually enjoy. Twitter is my favourite social network because of it’s simplicity and immediacy. I’m blogjunkie on Twitter. I’m so lucky my wife loves me, despite being the geek that I am. And now you know more than you needed to know about me. 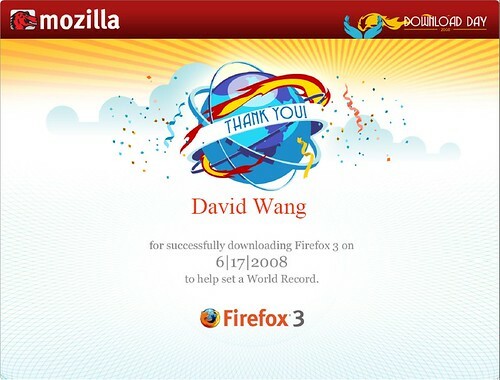 I’m downloading Firefox 3 and helping set a Guinness World Record this 17 June – Download Day.